We are pleased to present "Tulip" - the 2015 Springtime Bunny! Tulip is a darling brown and white bunny made of the finest alpaca plush with wool felt details. Sitting upright in a 'begging' pose, Tulip measures approximately 9 1/2" to the top of the head or 11" including his wonderful sculptural ears. Tulip is disc-jointed at the neck and shoulders for expressive posing. German glass eyes and inset whiskers add to his highly-realistic appeal. 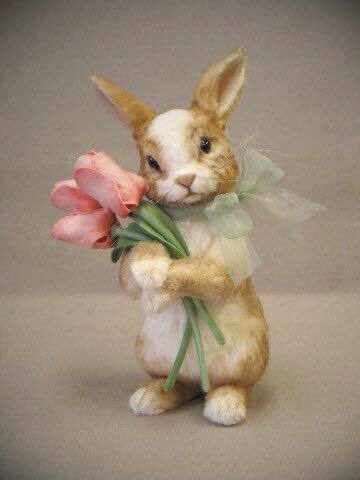 Tulip comes holding a beautiful spring bouquet of pink tulips handcrafted out of all-wool felt! These realistic flowers have molded details and incredibly-detailed airbrushed coloration. Produced in a limited edition of just 250 pieces, Tulip will include a signed and numbered certificate of authenticity and the forms for owner registration.